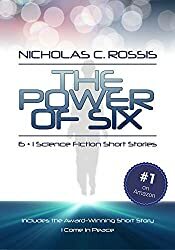 The Power of Six by Nicholas Rossis is a collection of six short science fiction stories. And when I say short, I do mean short. Not novellas. Each of the stories has a science fiction element, or some other strange happening. My favorite part was that most of these stories turned out to be just the right length for a quick pick-me-up between other tasks. Plus, author Nicholas Rossis has a unique way of looking at the world, and that comes out in his stories! Sometimes, the story isn’t as far away from home as we thought. If you like the sound of this collection, you can find The Power of Six: Six (plus one) Science Fiction Short Stories on Amazon. Or you can visit Nicholas Rossis’s website. He’s got another science fiction series called Pearseus and he’s also a member of the Rave Reviews Book Club.